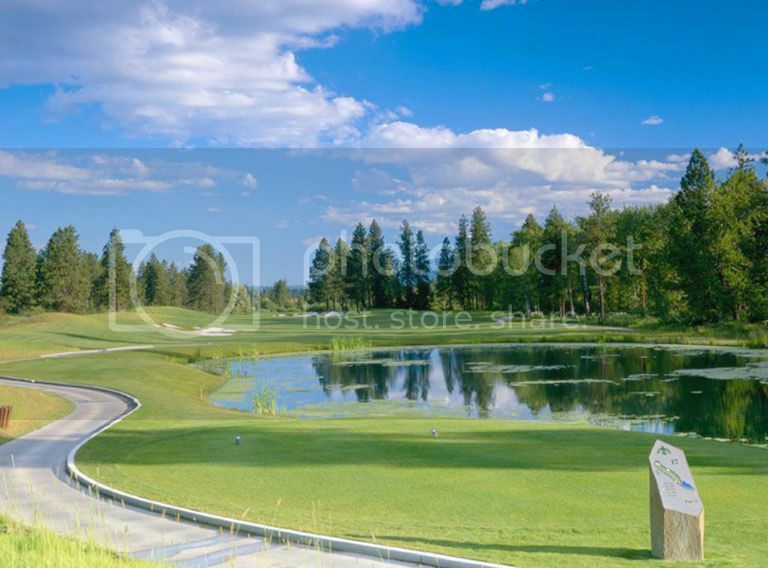 The rolling hills of the Palouse, 30 miles south of Coeur d’Alene, Idaho is home to the Circling Raven golf course and the Coeur d’Alene Casino resort hotel and spa. The hotel/casino hosts many events such as concerts, boxing and mixed martial arts as well as the gaming and restaurants. The golf course is an emerald green gem in the midst of the golden wheat fields and evergreen trees that dominate the area. 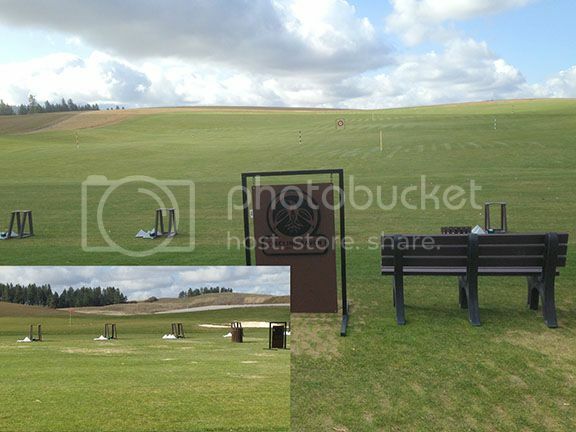 Driving Range – Pyramids of balls await you on this very large range with 10 different targets to shoot at from 60 yards out to 260 yards and lots of run out room after that. The distances are all lasered and marked on a couple of signs that are moved daily. It’s an all grass range that has 2 very deep teeing areas with plenty of room to move the tees so the grass has a chance to heal. There are 2 large fairway bunkers to hit from as well. The cost of all range balls is included in your greens fees. Wedge Range (inset above) – There is a “wedge only” range next to the full sized one with its own ball pyramids. There are 8 grass stations to hit from and are moved daily as well. It has its own gigantic green and 7 actual holes with flags to shoot to. It is approximately 70 yards to the farthest pin and a sign marks the distances to each one. A greenside bunker is on end of the green, so you can hit shots from 10 feet to about 40 yards. Putting Green – Very large, with plenty of undulations and 12 holes to putt to. The speed of it is very similar to the course greens. It has 2 “fairway” spots to chip from as well as the well groomed rough and “first cut” all the way around it. With the size and undulations in this green you can have just about any kind of chip you want to practice…flat, uphill, downhill, side hill, fairway or rough. This 25 acre practice facility has to be one of the best I have ever been to, so I give it the A+ rating. Fairways – The fairways looked to have been aerated about 3 weeks ago and were mostly healed. Normally the fairways are in fantastic condition and well-manicured. Rough – The rough here can be….well…rough at times. There are two cuts of rough and then most of holes are lined by “Protected Wildlife Areas” that are not to be accessed. The second cut of rough they tend to leave at 2-3” to try and minimize the number of balls and golfers going into the “PWA”. Sand Traps – Every hole has at least one big bunker and most have multiples. All of which are filled with white fluffy sand with a firm base that is perfect for getting that “thump” when you want it. Greens – The greens here are usually pretty fast, but like the fairways, they had been punched about 3 weeks ago, so they were just a little sandy and a bit slower than usual. On the norm, I would rate these greens as some of the best in the Pacific Northwest. Typically very receptive but still firm enough to get some speedy putts. The aeration is the reason I give the current condition the B+. Mid season, I would give it an A. The course is very challenging from the back tees with lots of long forced carries over protected areas. It is not a flat course by any means. Built in the rolling hills of the Palouse provides lots of elevation changes. 2 of the par 3’s have about 40’ of drop. Doglegs with trees and bunkers will make you ponder on your shot shape and gambling nerves. Holes 9 and 18 both come back to the clubhouse. There is little chance of hitting into another fairway as you are mostly separated by either trees or wide protected areas. There are some creeks to cross on the well-built wooden bridges. 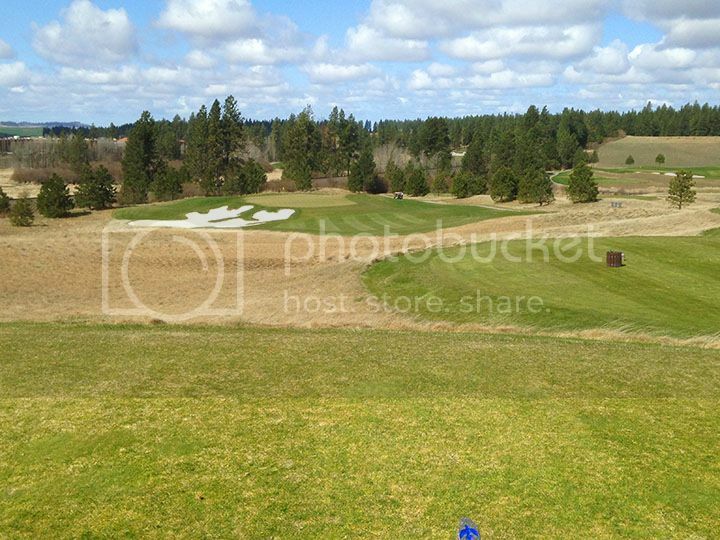 Five tee boxes offer a variety of course lengths from 4708 to 7189 yards. With this many options, there is enough challenge for any and all skill levels. My 4some which comprised of 2 couples played the course in 4 hours. We could have easily done it in 3 ½ if not for a few ball searches in the deeper rough. We also let a 3some play through on the 5th hole and then a 2some a few holes later. This course always plays fast and is not usually crowded. There is not a lot of walking since the distance between holes can be a real hike. Did you see Marshalls on the course? – Yes, we saw a Marshall twice. Based on the factors above, are the prices being offered by the course a fair value for the experience you receive? Yes, while the $95 (starting May 16) is more than a lot of courses in the area, the price includes full use of the 25 acre practice facility with all the balls you want to hit and a GPS cart. The carts are the safest ones I have ever seen. The gps automatically slows the cart down to 7 mph when coming to a downhill grade or one of the many bridges over the creeks and all around the clubhouse. You can order drinks and food between nines right from the gps screen so it's ready when you get there. Do they offer any deals or specials? Till May 15th the daily fee is $75 then it goes to $95. They offer replay rates of $45 all year. They have a variety of Stay and Play packages with the Casino hotel just 1 minute from the course. Rental clubs are Titleist (I believe) at $45 per round. Were the locker rooms available and clean? Very clean locker rooms with towels should you want to shower. Was there a person on the course selling drinks? 2 refreshment carts were out on the course with all sorts of beverages and food. Price examples – Fireball shot $6, beer $5, Soda $3, hotdog w/chips $5. Bathrooms on the course available? Very nice and clean bathrooms, one on each nine. Restaurants and/or Grill Room/Bar? The Twisted Earth Grill in the clubhouse offers a wide array of menu items. From full breakfasts to dinners. A full bar is in the grill. 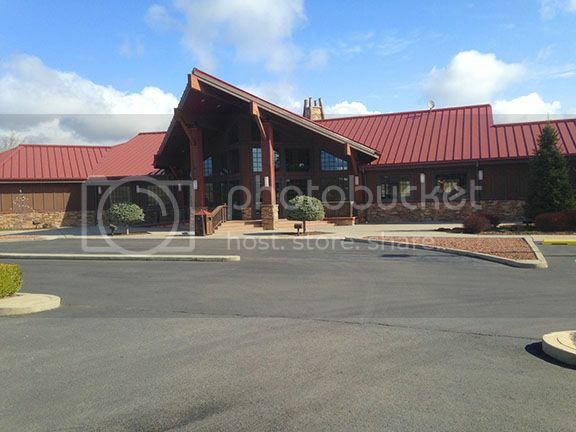 Clubhouse – Beautiful, spacious with lots of items and equipment for sale and well stocked. I could go on and on about how much I like this course and why, but I will keep it short in saying that this is a Must Play course if you visit this area. The course is always in terrific condition. The views of rolling wheat fields backed by tree covered mountains are beautiful. The course and surrounding area is home to varied wildlife such as bald eagles, deer, coyotes and elk that are often seen. The people that work there, from the clubhouse to the cart gals to the grounds crew, are always friendly and helpful. For all the reasons above in my review, I give this course the A grade. Last edited by Drumdog; 04-22-2014 at 07:08 PM. Well done. Very nice laid out review. Who thought Idaho was only good for potatoes??? I guy I work with was talking about going up there when visited the NW last week, will have to ask him how his experience was. Those ranges had me drooling! Thanks for the review. I've heard great things about this course. I would love to hear more about it and see more pics, but such is the nature of the format to be followed. Looks gorgeous. I've been meaning to play Circling Raven since it opened. My in-laws live in Spokane and I'm trying to fit a trip up there in between semesters with the wife. It's definitely on the play list along with the CDA Resort. Great review DD. The blue sky and wide open spaces bring tears to my eyes having lived in Idaho for 5 years. Wonderful pics in that review! Fantastic job and a great looking course. A part of the country I've never visited, would love to bring my clubs up that way some day. Ball: Varies- Callaway Chromesoft or Bridgestone B330-RX. This brought back good memories as I played there in 2010. I've got 3 or 4 different photos that I took which have been set as my desktop background since I played but I think the tee shot from #8 is my favorite. Thanks for the write-up Drumdog. Very pretty looking piece of land and layout. I live just outside of Spokane in Liberty Lake, so if you make it this way, let me know and we can set something up. 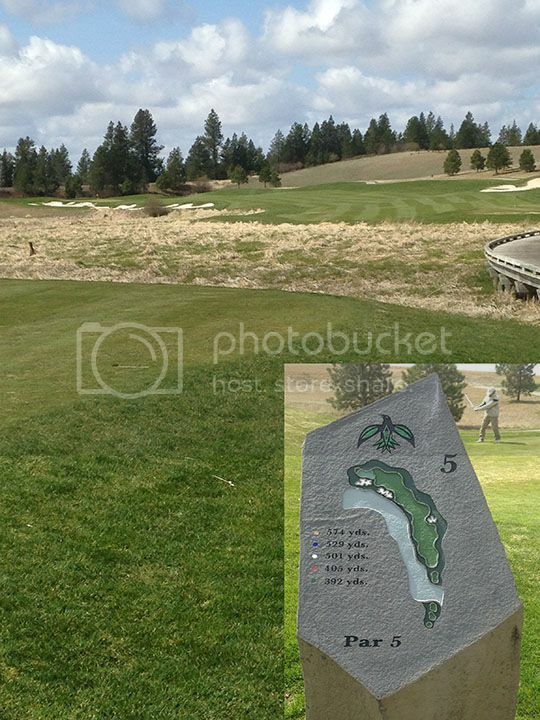 A great 3 day play of the higher end courses here is the CD'A resort, Circling Raven and Palouse Ridge. Man I want to play here so bad, I've heard great things, and this review only reinforces that. GREAT review, Drumdog. Just seeing your review now. Well done and congrats on the review of the month!